When winterkill starts and catfish flock to shad schools, give these tactics a try. On a freezing winter day, longtime South Carolina catfishing guide Joe Drose sits on his boat on Lake Moultrie studying his fish finder. The shad are suspended at 20 feet in 35 feet of water, too deep to be seen with the naked eye. But now and then a few cold-crippled shad surface beside Joe’s boat. We scoop them in a net and place them in a cooler for bait. Six poles in holders at the back of the boat are baited with shad caught this way, and as Joe talks, one goes down. I grab the rod and spin the handle. 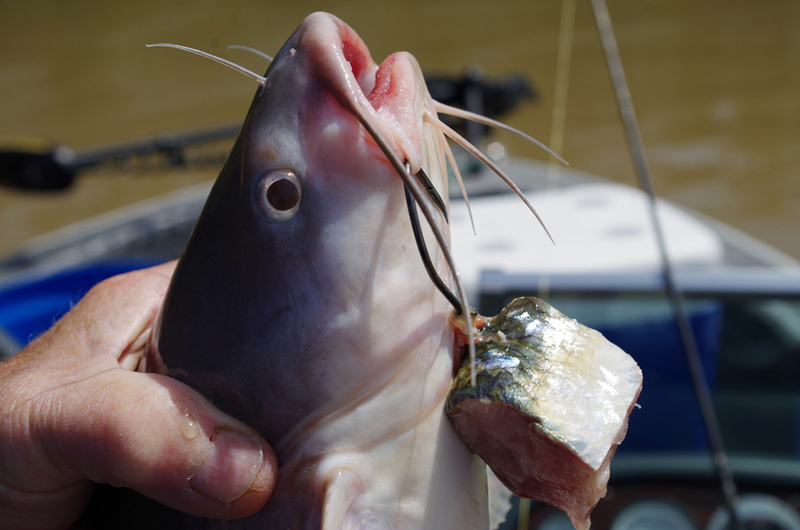 The circle hook at the line’s end catches in the corner of a catfish’s mouth. During the battle that ensues, I forget all about the intense cold. The catfish surges straight away and then begins spinning, wrapping itself in the line. Pulling it sideways through the water makes it feel like a monster, and though it’s actually small on a catfish scale—5 pounds—I’m happy when I bring it aboard. “As the shad start dying and filtering out of the schools, hundreds of catfish gather under each baitfish school, gorging on crippled shad drifting down,” Joe said. “This pattern may last three to four weeks. When winterkill starts, catfish flock to shad schools like bears around a salmon run. Dying baitfish are quickly eaten. The pattern may last a day or a month, depending on the weather, and while it lasts, fishing for big cats is excellent. The first order of business for winterkill anglers is obtaining shad for bait. This is simple: scoop dead and dying shad from the water with a dip net, then use them whole or as cutbait. The baitfish should be fresh and will attract more cats if you keep them on ice. Some anglers fillet the baitfish and use strips of the side meat. Others cut each baitfish crosswise into sections—head and tail, or head, middle and tail—and use the resulting chunks. Still others use only the guts—shad “gizzards” as they’re often called. I prefer using 3- to 4-inch whole shad that I score on the sides to release cat-attracting juices into the water. 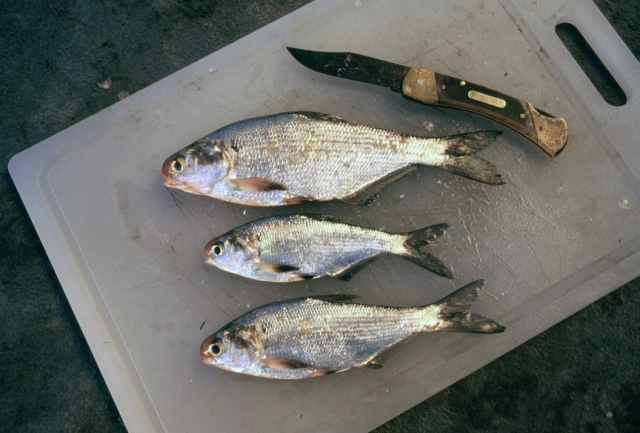 If only a few larger shad are caught, I cut each into three pieces—head, middle and tail—and start by using the middle or “gut” section. 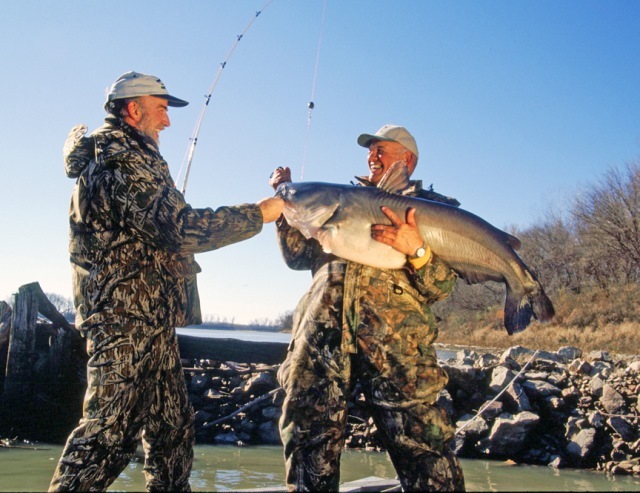 Dam tailwaters serve up some of the best big-river fishing during winterkill periods. Shad that die above a dam drift through the turbines and get sliced and diced in the process. Big catfish are attracted by the resulting “chum” and often stack up like cordwood in the tailwater, gorging on the easily gotten pieces of fish. In this situation, I prefer a float-rig presentation, so the shad bait drifts through catfish holding areas as it would when drifting naturally in the current. The simplest such rig consists of nothing more than a fixed bobber above a hook and perhaps a split shot or two. A more versatile version employs a 3-inch sliding bobber. A bobber stop and plastic bead are placed on the line so the sliding bobber just beneath them will suspend the bait at the desired depth. (I usually start by fishing the bait 2 feet beneath the surface, then move progressively deeper after every five casts until catfish are found.) Beneath the bobber, tie a 3/0 to 5/0 circle hook or octopus hook, then, if necessary, add several split shot to sink the bait. Cast this rig near the dam face and allow it to drift with the current. I use a 12-foot surf rod/spinning reel combo, which allows longer casts and permits me to maneuver the rig so it drifts through different areas. I find it particularly effective to bring the rig into the slower-moving water in the “grooves” between the dam gates. The bait often stops momentarily in these spots, and if the winterkill bite is peaking, a catfish is sure to strike when it does. I first experienced balloon fishing while fishing for winter striped bass in a large reservoir. My guide used sonar to pinpoint schools of shad with striped bass holding beneath them. He then positioned the boat over the baitfish and used a balloon rig to present the bait to the stripers below. A live shad was placed on a wide-gap hook with the point piercing the bait’s eyes. Above the shad, the guide tied a regular, round party balloon. This was cinched to the line with a tight overhand knot after being inflated to the size of a baseball. The balloon was pushed up so its position on the fishing line was the same as the depth the big fish were holding. The guide then slid the entire rig into the water and let the breeze blow the balloon out over the school of fish. The tactic worked on stripers, and it works just as well on catfish. Identify a school of shad on sonar, then look for bigger fish holding below it. These could be striped bass, but channel and blue cats follow shad schools, too, and often suspend beneath them. Two or three small shad impaled through the eyes on a 5/0 Kahle hook have proven most effective for me in this situation. It’s best to use no sinker. This allows the bait to flutter down naturally, just like a dead or crippled shad. Catfish waiting below can’t resist. Joe Drose and I had caught more than 50 nice catfish before our day of fishing ended. It’s like that when winterkill action heats up. Get out there this season and see.